To make sure food is produced and that there is enough to eat, the world relies on farms. Many people who work on farms are women in rural areas. These women should be treated with respect, because they contribute to the wellbeing of families and the development of rural economies. 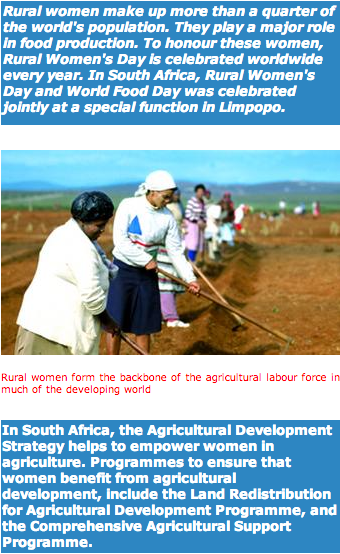 "Rural women form the backbone of the agricultural labour force across much of the developing world." With these words from the Geneva Declaration for Rural Women, Agriculture and Land Affairs Minister, Lulu Xingwana, paid tribute to women farm workers. Talking at the World Rural Women's Day and World Food Day celebrations in Limpopo in October, she said there was a need to honour these women. She told of how a Limpopo farmer refused permission to bury Mukumela Tshivhula (92), one of his long- time workers, on his farm. Her body was in the government mortuary for nine months before she was finally buried. This only happened after a court battle and talks with the farmer. Although rural women who work on farms make a huge contribution towards producing food in the developing world, half a billion of them are poor and lack access to resources and markets. In line with our Constitution, every citizen has the right to have access to enough food and water. To ensure that this happens, government has started a food security plan. The plan will bring together all the food programmes started by different departments. The Department of Health has found that 33 per cent of children up to the age of six years do not get enough vitamin A. This can cause blindness and a weak immune system. They have also found that one in four children between one and nine years old are underdeveloped because of poor diets and poverty. To help poor families, the Department of Health is now giving vitamin A supplements to children up to five years old and to women in all public health institutions. In addition, food like bread and maize meal is strengthened with six vitamins and two minerals to improve people's diets. The Department of Education also contributes to healthy eating by encouraging schools to start food gardens and providing meals through its National School Nutrition Scheme. The scheme gives meals on school days to about 6 million learners at 18 000 schools.